While the social and spiritual teachings of Confucius are now synonymous with traditional Chinese society itself, the first imperial dynasty, the powerful Qin state (221 to 206 B.C. ), employed the harsh ideology of legalism. According to the proponents of this strict form of governance, a monarch should seek to acquire as much political power as possible and apply strict laws to dominate all of society. China’s first great era of disunity, known as the Warring States Period, saw the rise of many schools of thought, including legalism and Confucianism. Various local rulers sought the advice of philosophers, teachers, sages, and scientists to aid their quests to lord it over the whole nation. During this time, the state of Qin was a remote region on the fringes of Chinese civilization lying in the mountains that hug the west banks of the upper Yellow River. In the fourth century B.C., Qin’s ruler Duke Xiao began a search for capable men to help him lead his land and people to greatness. Shang Yang was the man who brought legalism to Qin State, which would eventually conquer six other kingdoms to unify China. Unable to find employment as a government minister in his native state of Wei in central China, Shang ventured to the west to heed Duke Xiao’s call. The origins of legalism are varied, but Shang Yang was the first to develop it as a distinct political ideology. Taking the Canon of Laws, written by the scholar Li Kui, as his guide, Shang Yang met with Duke Xiao and was able to convince the leader to make him an important minister for Qin. One of the defining traits of legalism was its rejection of any morality not determined by the ruler through his laws. Shang and the successors in his school of thought believed that human nature was chiefly cunning and self-serving in nature. What the Qin minister wanted was obedience. 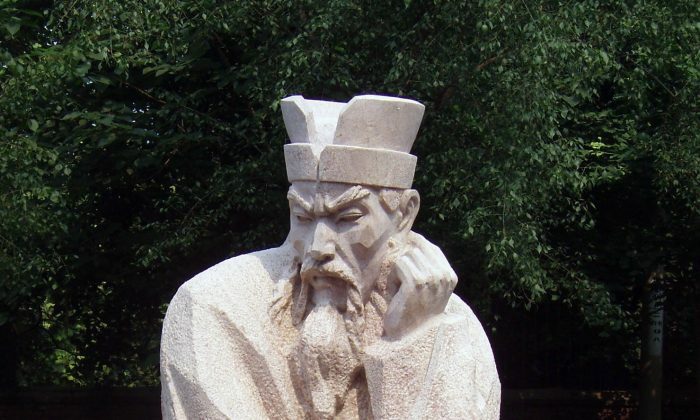 Early in Shang Yang’s career at the Qin capital, he made clear what he expected of his people, by offering the hefty reward of 50 bronze pieces for anyone willing to move a piece of wood from one end of the city to the other—a task so simple that only a man of poor intellect finally decided to attempt it. Shang promptly gave him the promised money and gauged the commotion that resulted among the people of Qin. Some spoke out against the ridiculous test, while others praised it. All were arrested. Legalism demands blind obedience, so anything the people said was irrelevant at best, rebellious at worst. Most Chinese states at this time were also implementing legal reforms to streamline leadership and improve public order, but Shang Yang’s actions were the most radical. He caused an uproar among the Qin nobility, but they could do little to stop him, because he had the favor of Duke Xiao. Shang had many nobles and scholars punished severely—death for some, mutilation for others. In ancient China, defacing the body was seen as an especially horrific punishment usually reserved for those convicted of serious crimes. Shang Yang’s reforms also focused on maximizing harvests to support large armies. Known to the people of other Chinese states as “tiger and wolf divisions,” Qin soldiers entered battle with little sense of chivalry or regard for their own lives as long as it meant reward and status for them and their families. The reforms of Shang Yang paid off. In 341 B.C., strengthened by the strict new laws, Qin was ready for war against its age-old enemy and Shang’s homeland, the state of Wei. Lying along the Yellow River was a disputed land containing 10 cities, which Shang conquered through a combination of underhanded tricks and brute force. Hailed by the Qin Duke Xiao as a hero, Shang received a sizeable fief and basked in his own glory. At a lavish and well-attended banquet, he boasted of his achievements. Those in attendance showered him with praise, but one man, a doorkeeper, stood up in dissent. Shang was puzzled and asked him about his silence. “I will tell you the truth of your situation if you promise not to kill or punish me,” the doorkeeper said. Shang Yang agreed. “How do I compare to the great Baili Xi of old?” Shang asked. Baili Xi was a Qin minister who had lived more than 200 years prior to Shang’s time. He served the Qin Duke Mu, known for his generosity and virtuous rule. Baili Xi, the doorkeeper said, was loved by the people of Qin. He worked directly with the common folk and did not feel the need for any guard. When he died, the people wept as though their own parents had died. Shang Yang, by contrast, ruled only through the power of Qin’s sovereign, Duke Xiao. In the 20-some years of his government, the people of Qin felt only terror, not respect, for Shang and his laws. They knew only profit and forgot morality. Furthermore, the doorkeeper warned, the heir to the Qin throne was not favorably disposed to Shang Yang, so his authority would last only as long as the reign of the current duke. As the doorkeeper predicted, Shang Yang’s fortunes changed rapidly once Duke Xiao died the next year, in 338 B.C. His son ascended the throne to become King Huiwen of Qin. The new ruler immediately took steps to apprehend the powerful minister. Shang Yang changed into common dress and fled—but at the first inn he encountered, he was demanded to show identification documents. Trapped in his own regulations, Shang, tired and despondent, was soon captured. He was accused of treason and executed. Shang Yang was dead, but King Huiwen and his successors maintained the legalist system for over 100 years after his death. Qin would only grow in power until the king Ying Zheng, who became the first emperor, unified China. But he died after 12 years of rule, and the dynasty buckled. Kangxi, Yongzheng, and Qianlong are remembered for their personal discipline and measured dedication. The king Goujian suffered military defeat but bided his time to execute the long game—one that took 20 years. The Han Dynasty imperial officers never found the Celestial Steeds they were searching for. What they did find was even more valuable.